Established in 2010, Harlem Youth Publishing Empowerment (H.Y.P.E. ), recruits and trains the next generation of publishers in Harlem. HYPE is a community-social enterprise youth publishing organization designed to support and develop young minority publishers age 13-17 and prepare them for the professional field of publishing and/or higher education. HYPE is a non-profit organization of Harlem World Magazine. HYPE developed out of the recognition of the enjoyment some minority youth had in the publishing field, and the lack of minority publishers, both in the publishing industry and at the academic level. HYPE takes advantage of the appeal of the publishing world to young minority populations in order to empower and promote both professional and academic opportunities and success. HYPE addresses all aspects of life by providing programs and assistance with arts, education and health issues. 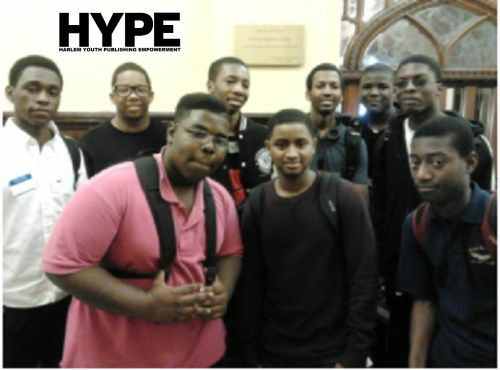 HYPE is a Harlem based organization that teaches youth the publishing industry. HYPE aims to teach the skills of Photography & Video, Graphic Design, Production, Writing, and Advertising. Current Program and Accomplishments—HYPE is structured as a community-run organization to maximize professional and academic networks for minority youth working over the last few years with (IUME) at Teachers College at Columbia University, City College of New York, Harlem Children’s Zone, Brooklyn College BCAL Spot, Susan Taylor, National CARES Mentoring Movement, Columbia University, The Institute for Urban and Minority Education, Teachers College, Columbia University, Wadleigh Secondary School for the Performing & Visual Arts, Project STAY, GQ Magazine and many others. The Board of Directors includes local community members, professionals in the publishing industry, members who hold academic positions in journalism schools, a social worker who will serve as the program director, and an accountant who will manage the financial responsibilities of the organization. In collaboration with high schools and other organizations, HYPE aims to meet the demanding needs of minority youth in Harlem. Photography and Video: Youth learn how to express their emotions, thoughts, and reactions through photography and video. Youth learn how to use photography and video as a method of communication and expression. Youth learn how to report stories by using creativity and looking beyond the surface. Youth learn how to analyze and critique existing media. Graphic Design: Youth learn basic skills in publishing through basic to advance technology workshops. Youth become accustomed to the latest technology tools to design editorial work. Youth learn how to gather photos, videos, and writings to produce content on print and online forms. Youth learn how to analyze and critique existing design material. Production: Youth learn basic to advance skills in video production and print production tools. Youth learn how to analyze and critique existing production material. Advertising: Youth learn professional marketing, sales, and presentation skills. Youth learn how to analyze and critique existing advertisement material. Youth learn how to use the internet for professional social networking. Youth publish and maintain a professional portfolio of advertising work and events. Youth produce sales content that is available to the public. Youth broadcast material online (HYPE site), upload portfolios, create an annual HYPE magazine and advertise. Writing: Youth improve literacy skills and become prepared for academic writing by participating in journalism workshops and creative writing workshops. Youth learn how to create short and precise stories (blogs and Op-ed pieces). Youth learn how to analyze and critique existing written material. College and Career Preparation: Through several workshops, youth are taught useful techniques that will assist them in a professional career and at the college level. Youth learn how to work independently, in groups and are prepared to make individual and group presentations. Youth network with professionals and visit local colleges. Youth have an opportunity to be part of the internship program the following fall semester at a publishing company or college. Many questions how a publishing media program will help students find employment and or guide students into higher education. The answer is simple; the program addresses the specific needs of today’s youth. According to Lenhart et al. (2005), in 2001, 24% of youth age 12-17 used some form of technology and in 2005; the use of technology grew to 87%. Today’s youth are continually looking for ways to express personal and group emotions through technology. In other words, if youth are engaged through technology, media, and publishing, then any successful intervention program should center their work to use an already engaging platform for youth into a forum of opportunity for success and a better future. Leadership Development—According to Cox (2010), there are only 16 minority CEOs in the Fortune 500, and only 8 black executives have ever made it to the Chairman or CEO position. Although the numbers of minority leadership is growing (Schachter, 2003). It is important to note how to effectively engage minority youth in ways that will positively impact their leadership skills. Participation in technology has been seen as “the new wave” of youth intervention (Macgill, 2008), and can be seen as an effective way to build leadership skills among minority youth. Copyright 2010 – 2019. Harlem Youth Publishing Empowerment is a social enterprise organization.